Footy-Boots has had lots of requests for more information on the new Nike Total 90 Laser football boot, which was launched last week by Wayne Rooney. The new Nike football boots’ upper comes in either kangaroo or kng-100 on the firm ground and on the soft ground in Teijin synthetic leather or kangaroo, both the fg and sg versions are priced the same by Nike. The big topic seems to be colourway – many footy boot fans are not taken with the yellow, or zest (to use Nike’s term for the colourway). So far, unfortunately, we have only seen the T90 Laser in this, as worn by Wayne Rooney in training and Claude Makelele in action this week. There are also rumours of a white and gold colourway, and an blackout version to rival the forthcoming Adidas Predator Absolute Blackout. The Nike Total 90 Laser will be available from May 31st 2007. The price originally set by Nike was $185 (£95), but already the football boot is being seen offered at $170 in the US (at www.soccershopusa.com) and £120 in the UK. UPPER: Soft and supple Kangaroo leather or KNG-100. Innovative S.P.P technology; ball control and shooting accuracy. E-Vent membrane keeps the foot dry. MIDSOLE: High-density molded EVA sockliner reduces studs pressure. Heel Zoom Air unit provides low-profile cushioning. OUTSOLE: Lightweight TPU plate combining conical and oblong studs for unique traction. Innovative Interwave spinal structural bars for perfect motion control and balance optimization. We are working on getting our hands on a pair of Lasers for a review so we can see if the Nike Laser lives up to its claims as the best football boot Nike has ever produced! Anybody know when are the new black and white colourways available in the UK? where can I see the Metallic silver/sport red- black dark charcoal (kangaroo)boot? wayne rooney scored in the new black and white lasers….. When do they come out in the US? Are the football boots light and do they allow you to run fast? because I need speed for my game. can anyone find me images of all of the colour-ways for this new boot. Will they come out in kids small sizes C10 ! I already have em!!!!!!! !They are so comfy and light! I already have them!They are so light and comfortable! PLEASE GOD!!! GIVE ME THOSE BOOTS!!! I just can’t wait to get’em! Only… i’ve got to crow away those shoes i already have, not wastin’ money ya know! 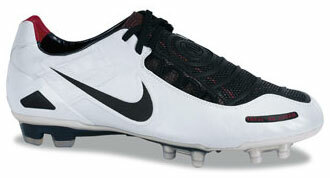 HAHAHAH, eveyrone who hates these cleats will be kicking themselves when these cleats boom on the market. i have the k leather white and black ones. the k leather is the best i ever had plus with the traction and touch i am unstoppable. get the k leather only. not synthetic. believe me. the k leather lets you shoot better and dribble better. KNG-75 leather vs KNG-100 leather. which is the best quality and lightest? does any one know when the new lasers are coming out in red, in the UK?